By the turn of the twentieth century, the United States had evolved from a British colony into an international power. As a result of the Spanish-American War, America had acquired colonies in both the Atlantic and Pacific Oceans, as well as a taste for international politics. Then the First World War erupted. As it dragged on, Americans fiercely debated US involvement; the nation had a deep tradition of avoiding foreign wars. But while the Spanish-American War had challenged this tradition, the First World War would shatter it. President Woodrow Wilson called World War I "a war to make the world safe for democracy." But the conflict brought neither safety nor democracy-instead, governments restricted personal and economic liberties to better pursue the war. In Russia, the Bolsheviks would translate an antiwar groundswell into a communist revolution and revolutionaries around the world would look to them as a model. Even the Treaty of Versailles, which formally ended the war between Germany and the Allies, brought no security. Of the treaty and its harsh terms, a French representative declared, "This is not peace. It is an armistice for twenty years." 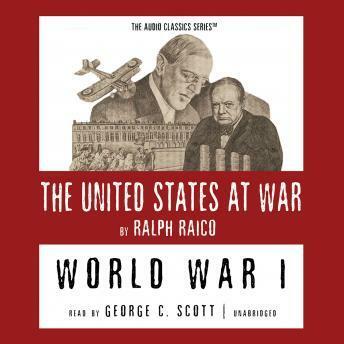 The United States at War series is a collection of presentations that review the political, economic, and social tensions that have erupted in military conflict and examine how the conflict resolved, or failed to resolve, those tensions. Very informative view on the Great War. Compares well with others Ive read and listened to. Mr. Scotts narrative mixed with actors playing first person adds a voice for those who served that are no longer with us and keeps my attention versus those that use a single reader.